A natural air dried treat from Beef Cattle Long lasting and very popular Good for Teeth & Gums, For Medium & Large Dogs 5-6 Inches Long Bully Sticks can aid in keeping gums healthy, removing tartar and can help clean teeth if used regularly. As always though we do like to remind dog owners that nothing beats teeth brushing. We recommend that if you want to make the Stick even harder that putting it in the freezer overnight is a good option. Brace yourself for this one, folks. 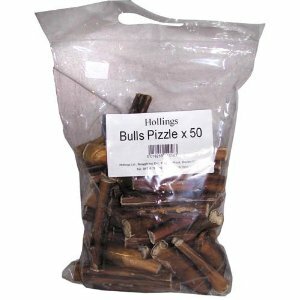 Bully sticks, aka beef pizzles, pizzle sticks, beef sticks or steer stix, are made from 100% bull penises. That’s right, bull penises… what more can we say? They’re cut, dried, drained and flavored, and can be completely natural and organic. Compared to other dog chews, they tend to last quite a long time, and most dogs love them. They’re also naturally low in fat and can help keep your dog’s teeth clean. There is, however, one big problem that usually drives people away: Once dogs begin to chew on them, many bully sticks release a rather unpleasant odor. Your dogs won’t mind – but you might. All-natural dog chews are a great alternative to rawhide * Tough, irregular surfaces clean your dog's teeth as he chews * Steer pizzle is a natural source of protein Made from real dried steer pizzle, these chews are incredible favorites and a great alternative to rawhide. The rich flavor and crunchy texture keeps dogs chewing for hours. You'll love that the chews clean plaque off your dog's teeth while he chews. Braided Pizzles have even more surface area with bumps and ridges for teeth cleaning and gum massage. Natural chews will vary in size. Please click on "More Information" for chewing recommendations.